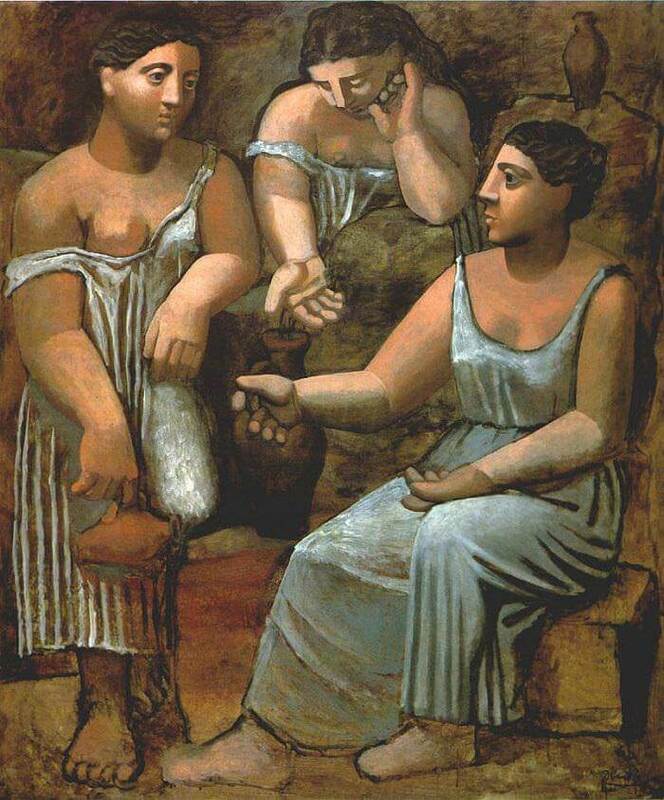 This wonderful picture's primitive, early Mediterranean feel is another vibrant example of Picasso's monumental neo-Classical figures. The three women emerge from the rocky scene like gigantic sculptures in relief, their strong chiselled profiles and exaggerated statuesque contours reminiscent of late or provincial Hellenistic styles, from the time of Alexander the Great's successors. The massive work is 204 x 174 cm (7 x 5.5 ft) in size, and its perspective draws the viewer's eye up to these huge shapes. The strange rotundity of the bodies is not only juxtaposed by the heavily hewed faces but by the deep gouged-in lines to denote the folds of the dresses. The accentuated width of these folds and the dramatic use of colour to create them - silvery in quality, against the bright blue -add to this sense of heightened relief, contrasting with the browny ochre backdrop of the rocks. This use of folding to create motion and define shape is similar to techniques Picasso used in earlier pictures from the Blue Period, such as Mother and Child (Maternity) (1901). Here, instead of creating a rhythm to counteract the strong perpendicular lines of the chair, the folds act in reverse, creating a heavy, angular tension.